The CBD Storage World Square facility combines the most modern security and management systems including CCTV and storage unit alarms to provide the first ‘drive-up’ Self Storage facility in Sydney. Specifically developed to assist customers with local self storage solutions. This storage facility with its comprehensive range of storage options from cubic metre lockers to garage size storage units provides the most convenient, accessible and professional Self Storage for personal and business storers. The World Square location is in the heart of Sydney’s residential district providing additional space for those with a busy lifestyle whose interests and hobbies like sporting equipment and seasonal items require more room than they have at home. 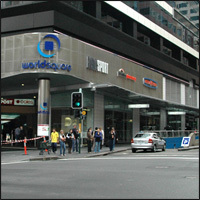 Head to the entry of World Square on the corner of Pitt St and Goulburn St. Follow the pictures in the gallery below. We are located at Level P6 in the World Square shopping centre.